Funny story… I’m in the car with my husband and he says let’s go to the Habitat Restore in the Port. Oh boy! I’ve been wanting to see the new estuary nature place that I read about! I was pretty excited that dear husband would suggest it. That’s the spirit of adventure! And then we pulled up here at the Habitat for Humanity Store at 505 Puyallup Ave., Tacoma, WA 98421. Oh, I see. We need bathroom tiles. No, really its OK. I just had my heart set on seeing ducks! In actuality the Habitat for Humanity Store is very cool and I’ve been meaning to go there. 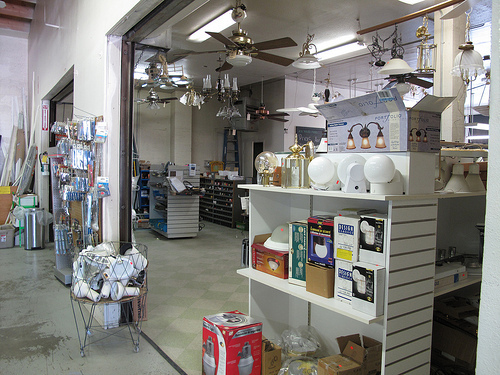 Folks donate building materials (doors, lighting fixtures, tile, cabinets, mirrors, etc.) and other folks buy them. Habitat makes a little money for their most excellent work. We walked out with some tiles, groat, and a ceramic soap dish to go in the shower. No ducks. I guess I can do the Habitat for Humanity store again in the future because they are moving to South Tacoma Way and the building is available for lease. This entry was posted in Non Profits, Stores and other places that sell you things, Tacoma, Their future is in question, Uncategorized, Unique Shopping (stores with some personality), WA State - Pierce County and tagged construction, Habitat for Humanity, hardware, moving, Puyallup Avenue, resale, store, Tacoma, WA State - Pierce County on August 1, 2011 by admin.